Last week I bought myself an Apple Mac Mini (late 2009 model) and after a few mishaps regarding video adapters, I finally got it up and running towards the end of the week. Needless to say I was growing ever more impatient as it was sat on my desk doing little more than collecting dust and awaiting the arrival of the correct adapter. Having been an avid Windows user for my entire life up to this point, I was originally apprehensive about switching. Obviously, I have had the odd experience with Mac OS X before and was impressed to say the least, but I have not had the opportunity before now to explore the entire operating system. Anyway, on with the Mac Mini review! Even before I had torn through the Mac Mini’s packaging on delivery, you could tell just how tiny the machine was. The entire box was easy to carry in one hand which is remarkable considering this is no lightweight in terms of performance or build quality. I opted for the basic model as I decided the extra juice was unnecessary for my purpose with the machine. This model packs a 2.26Ghz Intel Core 2 Duo and 2Gb DDR3 RAM. I personally only intended to use this machine for the basics. Internet browsing, e-mail, instant messaging, word processor and a bit of media management. Nothing too taxing at all which is why it comes as no surprise that this £500 model can carry out all of these tasks simultaneously without a hitch. This machine is surprisingly capable. I decided to run a few basic games such as Age of Empires 3 and was delighted to find that I could run the game on pretty much full settings at a high resolution without a problem. This is mostly down to the fact that within the latest batch of Mac Mini’s you will find the same Nvidia 9400M graphics chip that have featured in many of the aluminium unibody Macbook Pro’s to date. As well as gaming, the Mac Mini is also capable of driving full 1080p video playback which is becoming increasing common in small form factor, low power PC’s so I would expect nothing less from this. Sticking to the media theme, if you are someone who likes to have an extremely tidy environment whilst carrying out basic computing, watching movies or listening to music, you will be pleased to hear that the Mac Mini, remarkably, features built in speakers which aren’t exactly Bose standard, but they do the job if you are happy to compromise quality for style. Moving away from performance; in terms of aesthetics I am yet to come across a desktop PC that looks quite so elegant and stylish. The aluminium body is completely unblemished by the likes of USB ports and such as these are all located at the back of the machine out of site. You might think, I don’t want to scramble at the back of the machine for USB ports, however the Apple keyboard that I bought with the Mac Mini for an extra £25, features a couple of much easier access USB ports that should be used for removable storage and such. In terms of other features, the Mini has built in bluetooth which is perfect if you opt for Apple’s wireless peripherals such as the ‘Magic Mouse‘ or a wireless keyboard. It also has a slot loading ‘superdrive’ (DVD writer) which is extremely discreet. In terms of connectivity, at the back of the machine there are 5 USB and 1 FireWire 800 port as well as the typical audio-out and microphone-in ports and an ethernet connection. The video output connection is Mini DisplayPort. This is where I ran into trouble with the adapters as I have a VGA monitor. However, thanks to some fantastic customer service from ‘Walter’ at Apple, I was sent the correct adapter free of charge. My previous desktop PC was a custom built tower which I must say, was pretty noisy at the best of times. Quite annoying if I wanted to leave it on all night to complete updates or media conversions etc. However, with the Mac Mini, everything is quiet. The machine is barely noticeable and if it weren’t for the subtle white LED power indicator at the front, I would forget it was switched on. For those of you who care a great deal for the environment, you will be pleased to hear that the Mac Mini is the most environmentally friendly and energy efficient desktop computer in the world. 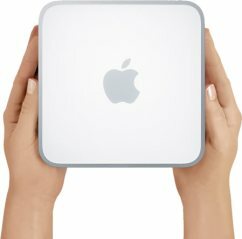 Overall I would massively recommend the Apple Mac Mini to anyone who wants to make the switch from PC to Mac and doesn’t need massive quantities of processing power. Purely because it is the cheapest Apple Mac available and is perfectly capable of anything that an ordinary user would ever throw at it. Not to mention the fact that it’s unbelievably stylish (in keeping with everything Apple) and doesn’t consume much space at all. It is available in 3 models after the Mac Mini update in early 2009, this one, as well as a more powerful 2.53Ghz Core 2 Duo, 4Gb RAM model or the server edition which sacrifices the optical drive for an extra 500Gb hard drive. They range in price from £510 right up to £816. Of course, you can customise them to your satisfaction and take the price almost as high as you’d like.